From St. Cloud: Take Hwy 10 West. Take the first exit (County Rd 76N) into Little Falls. At second stoplight (Hwy 27) take a left. Go approximately 12 blocks West. From Brainerd: Take Hwy 371 South. Merge onto Hwy 10 East. Take the first exit into Little Falls. At first stoplight (Hwy 27) take a right. Go all the way through town, approximately 2.5 miles or 28 blocks. We are three blocks past Pine Grove Zoo. From Randall: Take Hwy 10 East. 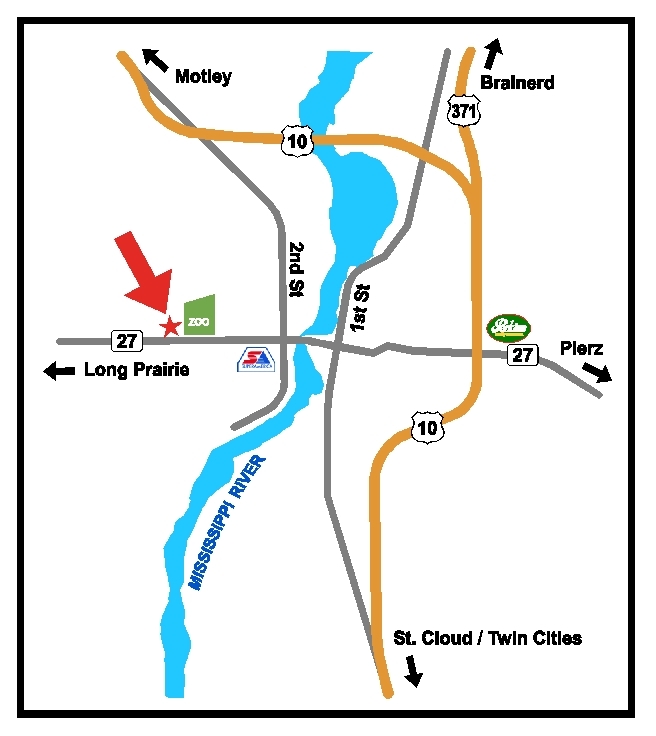 Take the first exit (County Road 52) into Little Falls. At the first stoplight (Hwy 27) take a right. Go approximately 11 blocks West. Copyright © 2014 Froggy's Signs Inc. All Rights Reserved.